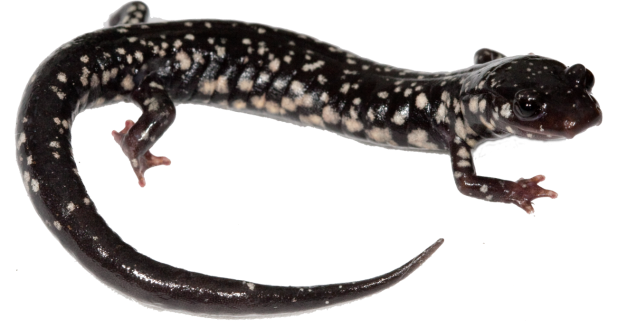 Effects of experimental forest management on a terrestrial, woodland salamander in Missouri by Daniel J. Hocking, Grant M. Connette, Christopher A. Conner, Brett R. Scheffers, Shannon E. Pittman, William E. Peterman, and Raymond D. Semlitsch. This is the first post in what will hopefully becomes a series of brief summaries of my papers as they are published to further stimulate discussion. This post refers to the recent paper in Forest Ecology and Management: http://dx.doi.org/10.1016/j.foreco.2012.09.013. Please email me if you would like a copy. Red lines represent transects of coverboards. Black lines are drift fences with pitfall traps. We were interested in how various forest management practices affect the terrestrial, woodland salamander (Plethodon albagula: Western Slimy Salamander). This was part of the larger Land-use Effects on Amphibian Populations (LEAP) project in Missouri. 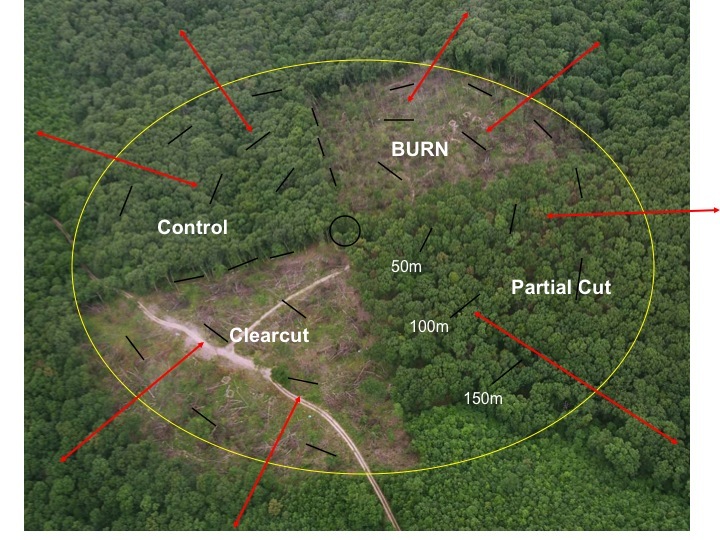 In 2004, we experimentally cut areas of forest surrounding amphibian breeding ponds. Around each pond there was an area that was clearcut then burned (burned to help reduce maple regeneration), a clearcut, a partial thinning cut, and an undisturbed control forest. This array of experimental treatments was replicated in four locations. Woodland salamanders rely heavily on forest habitat and are sensitive to changes in temperature and moisture. They are lungless and breath through their skin. This type of respiration requires that they stay in relatively moist microhabitats, but logging alters the temperature and moisture of critical microhabitats. Although this study was originally designed to examine the effects on pond-breeding species, we took advantage of the large forestry experiment to determine if particular forest practices were better for sustaining populations of slimy salamanders. To this end, we placed coverboards in two transects in each treatment at three of these replicate forestry arrays and checked for salamanders periodically over 5 years. We have a related publication comparing carpet and wooden cover objects here. We captured a total of 300 Western Slimy Salamanders between April 2007 and September 2011. We found significantly fewer salamanders in the burn and clear-cut treatments compared with the partial and control treatments. We also found a lower proportion of juveniles and had fewer recaptures in the burn and clearcut than in the partial and control treatments. Consistent with other studies of woodland salamanders, our results suggest that for at least the first 7 years post-harvest, clear-cutting is detrimental to woodland salamander populations. This initial reduction in abundance combined with the further reduced proportion of juveniles may have longer lasting effects even as the forest regenerates. Finally, it appears that timber harvest resulting in limited canopy thinning may be compatible with maintaining populations of Western Slimy Salamanders in Missouri. You can read more about our findings from the LEAP project including the effects on many other species and in different regions of the country in our synthesis paper here. To leave a comment for the author, please follow the link and comment on their blog: Daniel J. Hocking » Blog.